The current metagame in Theros Standard is comprised of several UW/x control decks or as we refer to them ‘ Sphinx’s Revelation decks’ and Devotion decks. All colors are represented in the devotion shell, but one: White. There have been a few lists here and there with Angel of Serenity and Boros Reckoners, but nothing really solid. At one point when Theros was just released there was even a certain ‘Sphere of Safety‘ deck. There are a few good white noncreature permanents to try a controlish build but not enough to really glue it all together into a consistent deck. The other devotion decks are aggro to midrange, with monoblack devotion being a sort of control deck at times. The white deck has to go to its roots and play the weenie role. While it’s not immensely popular right now, it does win its fair share of games and may get much better when Born of the Gods is spoiled. The creatures in this deck are referred to as weenies, but don’t confuse this term in meaning they are not tough. A lot of them pack quite a punch. Of course you have your ‘stats matter’ creatures, such as Dryad Militant. Let’s face it: with Snapcaster Mage gone, this card is basically a vanilla 2/1 that can be played in either Green or White decks. That’s just fine with us – we weren’t really looking to utilize its ability against the dire Spellheart Chimera. We also have a 3/1 for two mana in Daring Skyjek. Reminiscent of Future Sight’s Blade of the Sixth Pride with an actual ability. Having this be a 3/1 flier is very nice as the rest of this deck’s creatures don’t exactly have great forms of evasion (read : none). Pounding down your opponent’s life total early on with him is good too and even maybe having it trade with a more mana-intensive creature can be fine later one (but we aim to avoid trades in this deck). Soldier of the Pantheon is our other 2/1 for a mere 1 white mana and his ability can be extremely relevant. Just to list a few creatures he can attack past: Boros Reckoner, Nightveil Specter, Burning-Tree Emissary, Loxodon Smiter, Fleecemane Lion, Voice of Resurgence, etc. You get the point I suppose. It’s more or less ‘evasive’. While you may be focused on bringing the beatdown, you’ll want to remember that you can gain quite a bit of life with his other ability as well. It might not seem like a ton, but it can really give you the edge when you’re racing against another aggressive deck like Monored Devotion. While our one drops are all about bringing the aggro, the majority of 2-drops are there to give us some board presence. Whether you’re making extra 1/1 tokens with Precinct Captain, exiling an opposing creature with Banisher Priest or slowing your opponent down by a turn with Imposing Sovereign, you are advancing your board state. There is an interesting point on having both Banisher Priest and Imposing Sovereign in play. While in most normal situations your opponent can simply use a removal spell such as ‘Doom Blade‘ on your Banisher Priest in order to retrieve his exiled creature, he cannot during your attack step and then hope to be able to block with it. The creature he will get back will returned tapped and thus unable to block. It’s rather obvious, yes, but it’s extremely relevant to be aware of too. Of course I don’t need to explain that it’s somewhat risky to attack in a similar scenario without having Imposing Sovereign in play on your end. In this case, we probably want to make sure we keep a single white mana up for the eventual Brave the Elements we will need to counteract this nasty surprise. Banisher Priest is pretty sweet but you shouldn’t just play it whenever you can either. If you would lose one of your creatures in combat but then still manage to inflict a lot of damage to your opponent, you probably want to keep it in hand if you anticipate a larger blocker, board wipe or even an opposing Banisher Priest in the future. I have seen many players moan about how their opponent just drew the right card to recover and now they lost a chunk of their board presence. Truth is: their opponent was probably waiting for the right time to play his card as well. If you used your Banisher Priest on Monoblue’s 0/1 Cloudfin Raptor just because your really wanted to get in for the extra 2 damage, then don’t go complaining when you hit a brick wall in his following play of Frostburn Weird, Nightveil Specter or game-changing Master of Waves. Just because this is a white aggro deck does not give you the excuse to play sloppily. You need to make sure you make optimal plays, good attacks and pressure your opponent whenever possible. Throwing in an extra attacker which is going to get freely killed is terrible. I’ve seen this often and it makes me wonder if people understand combat. If your opponent is going to take the same amount of damage because X number of creatures will most likely go unblocked then what is the point of also attacking with an extra creature that will get blocked and just die. Note that this is different than actually trying to push through extra damage. I had come up with these example scenarios, but it’s like 3 AM, so I’ll keep it simple. 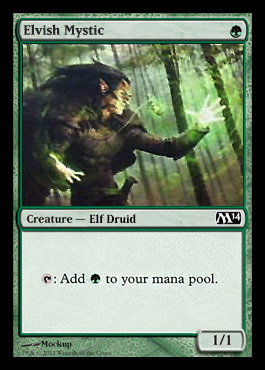 But basically doing something like attacking with an extra Dryad Militant which you know will get blocked, die and not trade is usually bad if the creature your opponent used to block it was not originally going to be blocking anyhow. Finally, Precinct Captain makes life very difficult for those decks that choose to not play any mass removal . Granted that monoblack devotion can’t really do that right now, not without a support color (green for Golgari Charm or White for Merciless Eviction). Once you start churning out those tokens with Precinct Captain you should be really making life difficult for those decks. You can also just flat out ignore Desecration Demon as well. He’s probably on of the best WW costed weenies of all time. Sure cards like Ratchet Bomb can hurt, but no one is really playing that right now. Also, it’s probably going to just take out a small wave of tokens, once. I even started to run Illness in the Ranks sideboard in my own monoblack deck against White Weenie (and Orzhov Weenie) and so far it’s been hit or miss. A) it’s a really grindy and tight game. C) you randomly killed a Guttersnipe after it resolved its triggered ability. Congrats! Ajani, Caller of the Pride has not seen much play recently but he is truly at his best in this deck. He boosts your little guys so they can become more battle ready against your opponents slightly bigger threats. He also allows you to go in for the killing blow with his flying/double-strike ability. If you find yourself needing his ultimate, well… good luck! 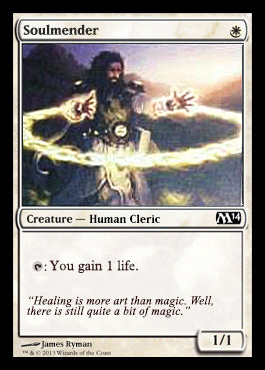 This little beast of a card is back in force to make white weenie a more legitimate contender. Whether it’s protecting one of your guys from a removal, making profitable blocks or making sure your dudes go in unblocked – it’s pretty damn good. Remember to leave that lone white mana up in order to make many opponents think twice before casting something they may regret. You often only need to lower your opponent’s life total to just under 10 life so that you can cast Brave the Elements and win in one big swing. Nowadays decks are very mono-colored that you probably only need protection from a single color to let your whole team through. Remember however: it doesn’t do anything for your Mutavaults. While the sideboard may seem all over the place, that’s because well … it is. It’s a bit of a mess but the cards do serve their purpose well. Keening Apparition is not something we are accustomed to seeing in most 60-card decks at all. It deals with: Detention Spheres, Bident of Thassa and Underworld Connections.That’s just a few things I came up with right off the top of my head, but there’s more. You definitely want to side these in against Esper and UW Control variants. They can be brought in to answer a Detention Sphere that’s already in play or simply played pre-emptively. I prefer to just hold them in hand and cast them as pseudo-Disenchants. However, if it’s Detention Sphere that you fear … there’s always : Glare of Heresy. Glare of Heresy also doubles as removal for cards like Elspeth, Sun’s Champion, Voice of Resurgence and Boros Reckoner (just to name a few). It’s a really good card in the mirror (duh!) as well as versus Esper. You might even get to hit some more random stuff with it (Loxodon Smiter ?) as well. Fiendslayer Paladin is no stranger to White Weenie deck sideboards. He basically gives you a good edge against Red Devotion decks as well as doing a good job at dodging Monoblack Devotion removal spells (just watch out for Devour Flesh). Don’t forget that he only can’t be targeted by red/black spells, so don’t have him randomly die to a Boros Reckoner damage redirection effect or commit him to a board that would still end up dead to Anger of the Gods. The presence of Last Breath in Standard sideboards sure has been increasing as of late. This can be attributed to creatures like Nightveil Specter, Gray Merchant of Asphodel, Pack Rats and a few other devotion enablers. In a format where cards like Doom Blade, Ultimate Price and co. have a somewhat tough time of hitting their mark, you might have an easier time sniping things with Last Breath (or Orzhov Charm if you splash Black). Celestial Flare is also no stranger to the White deck sideboard party. It does pretty well against things with Hexproof and protection from white. Of course the catch is that they more or less have to be the only creature attacking/blocking. It’s not the best solution against Blood Baron of Vizkopa, but we’ll take it. Don’t forget to keep your Imposing Sovereigns in the deck though, as they slow down the Bloodbaron quite well ( a turn is still a turn). At the other end of the spectrum, we run Rootborn Defenses. Yes, it’s obviously to save our army from something like a Supreme Verdict. We will rarely get the Populate benefit from it, unless we already have Precinct Captain soldier tokens in play. It’s not as awesome as Brave the Elements is, but even Brave the Elements does not save us from a total board wipe such as Supreme Verdict. I think this is more of a wildcard versus control decks that anything else. You at least get a 5/5 that can keep attacking them every turn on an empty board and is fairly safe from removal (not counting Detention Sphere). It’s probably better off as a third Keening Apparition or something, but it’s always fun to give more play time to the underused planeswalkers, no? If anything, the White Weenie deck will over time teach you how to play a tight game of aggro. When to attack, trade, block and protect your creatures. It’s all going to be combat damage, so no lucky top-decked burn spell or Gray Merchant of Asphodel here! Try it out at your local FNM or whatever other day of the week your store holds Standard constructed events. You might be pleasantly surprised. For those of you who were sick and tired of losing your little weenie horde to a Bonfire of the Damned (miracled or not), Wizards has the answer for you. Mind you this will probably be more played in a Green/White aggro style of deck but who knows – we might yet see a real white weenie contender. Its offensive capability is rather great as it can allow pretty much your whole team through something like a wall of Thragtusk or 3/3 Beast tokens if you’re going in for the killing blow. I can’t wait to get a chance to play this again in Standard. Does it simplify or complicate the black removal suite (Ultimate price, Murder, etc) ? Anyone ‘shocked’ to see this back? Now you can keep that one-lander! Just how good will it be? That ends another preview Blog for Magic 2014 and I for one think that the limited experience is sure to be dynamic to say the least. As far as constructed goes, I hope we can still get some more Standard playable cards before the totality of the set is revealed.